Eggs were on sale for 99c/dozen at the store 2 blocks from our house. So, tonight, when we had company, I served up deviled eggs, soup, veggies, rolls they brought, and ice cream. I was so happy to easily serve 14, a nice practice run for Thanksgiving, where there will be only a few more than that. It was great to see our friends. Different sets of friends are slowly making it down to visit us in our new home, and we are super excited to see them when they come. I got milk for 99c for 1/2 gallon, corn chips for 88c per bag and a few other items at Fred Meyers. 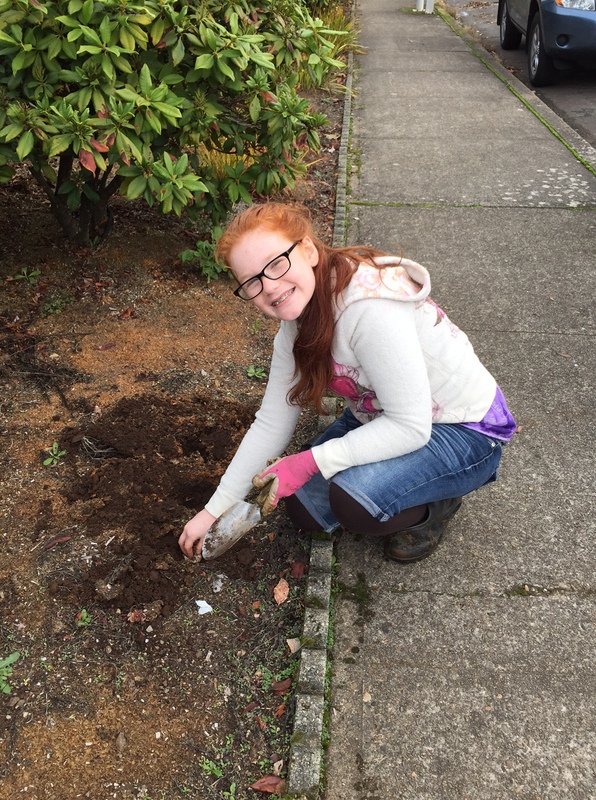 During the summer, my sister had Ja’Ana and Alissa dig up a flower bed for her, removing many bulbs. She shared a bucket full with us. On Saturday, Patsy planted a bunch of them near the sidewalk. There is nothing but a big blank area that gets really dry in the summer, so it will be perfect for bulbs. There are still some left, but a lot got planted. It should be a lovely splash of color for absolutely free. Rob got a lawnmower and mowed the lawn for the first time since we moved here, so things are looking good. We’ve had such a lot of stormy weather and were glad to get a nice day. J had a chance to go with the youth group to remove a tree that had fallen in the recent storm. The kids were paid into a fund that will be applied towards the next youth group outing they want to attend. Win-win! I worked a lot last week, which will translate into a bit more $. This week will be easier on me, and I have a lot to do around here, so that’s ok.
Rob’s job keeps changing a little each week. The first child he was originally hired for has moved on to another school. We are happy that they kept Rob on at the same school. For a while there, we were not sure if they could. So, they changed him to another child, and then another. He also rides the bus with yet another child, and this one gets on near our house, which saves him gas money. He is still getting used to what he is supposed to be doing, but is getting the hang of it more and more each day. He still has a job, and we can’t wait to get paid for the first time in a long time. So, that’s going well. 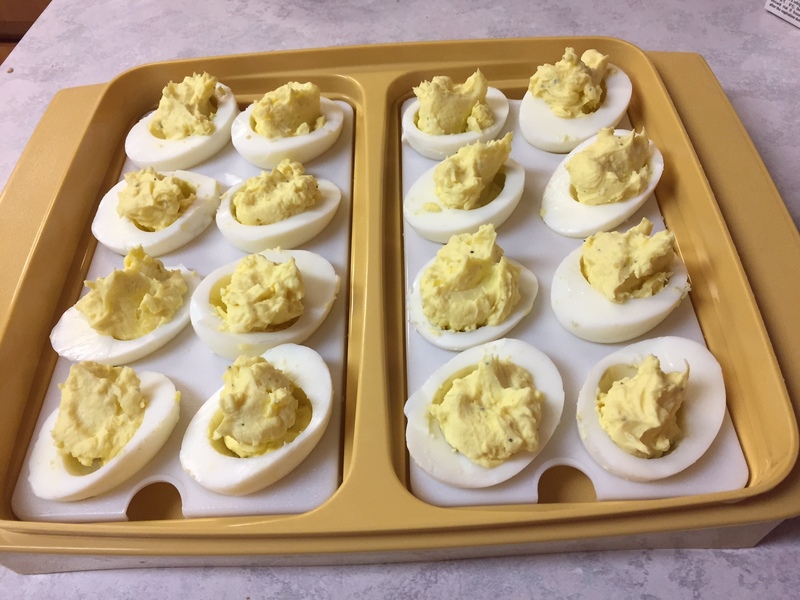 Your deviled eggs look delicious! Would you please provide your recipe? Cindy, It’s almost embarrassing–it’s so easy. I hard-boil eggs and cool them down. Then, I cut them in half and put the yokes in a bowl. I put the whites on plates. Then, I mash the yokes with a fork and add some mayo, Miracle Whip, salt and pepper. The ratio is about 2 parts mayo to 1 part Miracle Whip. I taste it and see if it tastes good. If it doesn’t, I add more, little by little, until it tastes good and is a consistency I like-not too mushy. Then I spoon it into the whites. I might sprinkle it with paprika or add some parsley if I want to get fancy. That’s it. Simple, but we love them. Thank you. They look delicious! I love how the youth group did the work for money for their activities! That was such a good way to handle that. I suspect that a lot of changes at the beginning of the school year are pretty normal, but the important thing is that they seem to be happy with Rob and are both keeping and expanding his hours. I know you will feel better when it’s all more settled, but I bet if you talk to people at the school, this is probably normal for the beginning. At my daughter’s high school, they even had changes starting at the second term (school here starts in early August, so they’ve been in for a while), which including adding new sessions and shifting the students around. It’s kind of a good thing for our school, as the reason for it is enrollment is up, after many years of decline, but I know it’s been hard for the teachers and kids affected by the changes. Yes, even today there were more changes! But, it was a good day, he said, which is nice. I am so glad that you are getting a little routine.I am so glad you are both working! I am glad Rob got to stay at the same school and even rides the bus. I have not done that since High School, I won’t tell you how many years that has been. Rob is in my continued prayers as I was an aid for some kiddos on the spectrum. As the kids figure out the schedule, I am guessing less melt downs will happen. 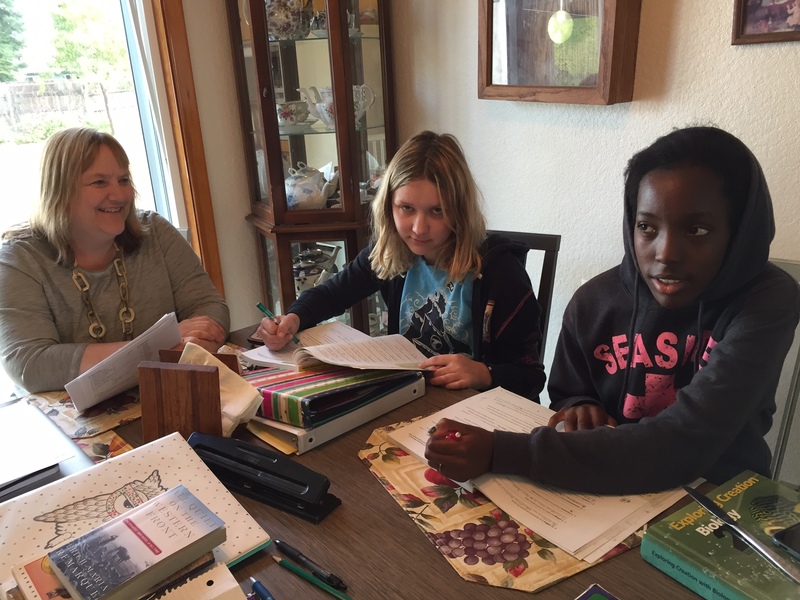 Becky how wonderful that you are homeschooling. I remember those years. So fun and wonderful to pour into those young women. I love that God has made a way. Thanks so much! It is rather humorous to us that Rob, who is quite big and tall, is riding the “little” bus:) He is well over 6 feet tall, and those seats were not made for him at all–but he doesn’t mind! Thanks for the prayers. This week is definitely more settled. We were thinking that, too. Changes are not easy for those kiddos and they should settle a bit as they get used to him more and more. So nice to read about everything going well! Sounds like a good time with friends, a great education for the girls, and steady jobs for both of you. Yay! I’m loving the sound of things going well, too:) Thanks! Yum. Love Deviled Eggs. Rob’s job is probably wearing him out with all the changes – it does make you tense even if it is not difficult. However, it sounds great. Thanksgiving will really be special this year for you guys. Yes, it does wear him out. He had an especially rough Friday–after his special charge got out of control on the bus, they returned to school, and I had to go pick up my “big boy” from school, as his vehicle was at a different location. Although we wouldn’t ever wish for that to happen, traffic was really bad and we got an entire hour “date” out of it by the time we retrieved our van–so it turned out really good:) But, the whole job is settling a bit for him, so that’s good. The kids are the same, he’s just learning how to help some of them better.